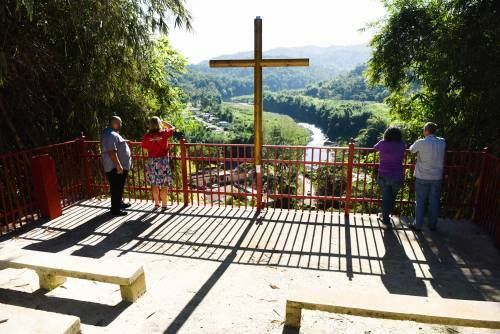 A cross and amphitheater overlook Campamento El Guacio in western Puerto Rico. (Photo by Rich Copley). 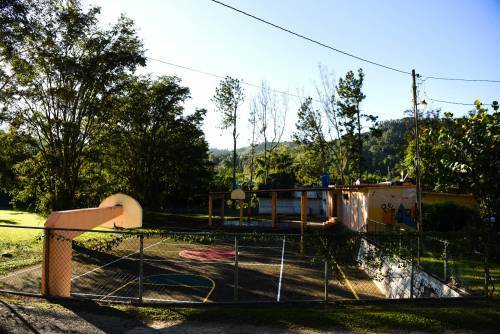 GUACIO, Puerto Rico — It is not hard for visitors from the mainland United States to draw comparisons between Campamento El Guacio and Presbyterian camps back home. “You can just imagine kids there in the summertime,” says Bryce Wiebe, director of Special Offerings for the Presbyterian Mission Agency, reflecting on the facility with the requisite dorms, dining hall and fields you expect at a summer camp. For Alonzo Johnson, coordinator of the Presbyterian Committee on the Self-Development of People, the camp in the western mountains of Puerto Rico brought to mind Camp Johnsonburg in New Jersey and Camp Kirkwood in the Poconos, near Philadelphia — camps he has attended and worked with. “I can’t imagine having a camp this beautiful,” Johnson said, recalling his December visit to Guacio. 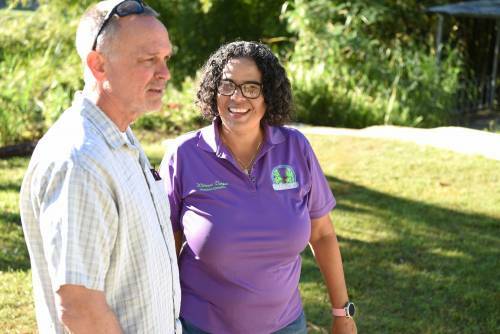 Wiebe and Johnson were part of a delegation of representatives from the church’s Compassion, Peace & Justice ministries that visited Puerto Rico in mid-December to see some projects they were already supporting and explore potential new collaborations. Guacio was one of the initial recipients of funds through Presbyterian Disaster Assistance (PDA) in the days following Hurricane María’s landfall in late September 2017. Though the camp itself was hard hit by María, a high-Category 4 storm when it made landfall, it quickly became a resource for the surrounding community in the weeks and months following María, helping supply needs from water and ice to a psychologist to help people shattered by the storm and its aftermath. 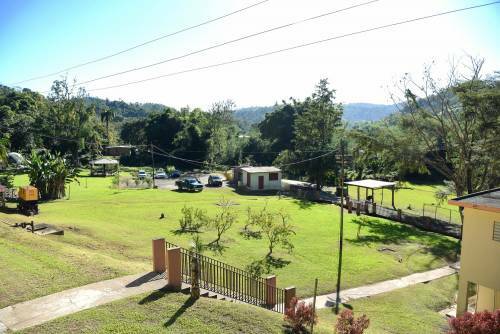 Johnson is referring to Guacio community leader Roberto Lebrón, who was part of a group that met with the Presbyterian leaders to talk about the camp’s historic and present-day role in the community, which are not all that different. Some of the community leaders that participated in a late morning meeting with the Presbyterian delegation included Marizol Vélez, Director of Presbiterianos En Servicio A La Comunidad (PESAC); Rev. Iris Dalila, Pastor of Guacio Presbyterian Church; Carmen and Carlos Umpierre, farmers working with the camp; members of the camp’s Board of Trustees; and Wilmari Vargas, director of the camp. 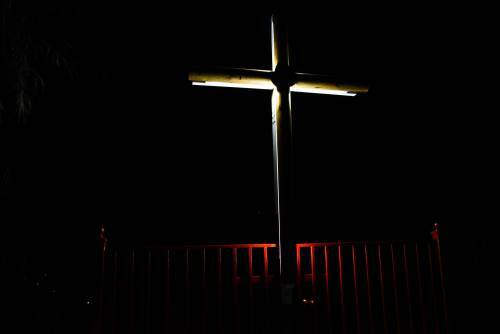 The director, whose father built the mountaintop cross that overlooks the camp, received widespread praise from the group for reviving the camp, which was at one point on the verge of being sold, even before the storm hit. “We saw how the facility after Wilmari’s arrival has grown from scratch all the way up,” said Keyla Candelario, who attended the camp as a child. “We came with a lot of young people to help her and other volunteers. While sustaining a lot of damage, including to its extensive stand of bamboo near the mountaintop cross, the camp remained a beacon to the community, able to supply necessities like power and water, which still have not been restored to some places in the surrounding community. Kirk says that the lack of government support for areas outside major population centers and tourist destinations makes PDA’s work in communities such as Guacio particularly important. In addition to providing agricultural opportunities to the community, Guacio is at the forefront of projects such as helping introduce solar power to the community, and it is restoring one of its dorm complexes specifically to house volunteers who come to work in the area. There are also ambitions to revitalize decades-old projects, such as functional crafts and construction from the bamboo. Click here to donate to continued hurricane relief in Puerto Rico.